Spain’s incredible journey at the Vitality Hockey Women’s World Cup came to a bronze-tinted end as they defeated Australia with a consummate display of creative, attacking hockey. The bronze medal match was a clash between Australia, the world number five team and 2014 silver medalists, and Spain who, with a FIH Hero World Ranking of 11, have played way beyond initial expectations. The Australian team had lost in shoot-out to the Netherlands less than 24 hours earlier, while Spain had lost to Ireland in similar fashion in the first semi-final. Australia certainly looked the more battered of the two teams contesting the bronze medal. Jodie Kenny was sporting heavy strapping on her shoulder and Renee Taylor was unable to play, so Lily Brazel had come into the squad as a replacement. Spain in contrast looked lively as they chased their best finish in a World Cup – their best previous result was fourth in 2006. Certainly it was Spain who came flying out of the blocks and were rewarded with a goal just ten minutes into the game. Maria Lopez was the scorer after yet another innovative penalty corner routine saw Lynch unable to react to the quick switch of play. Australia were still looking flat as Spain kept pushing and pushing for a second goal. Where Australia were looking to play the ball wide and up the sides, the Spain side were happy to create and push forwards through the middle of the pitch. Georgina Oliva, who has enjoyed a wonderful tournament, was able to architect several attacks with her clever passing. Both Rosie Malone and Brooke Peris showed their own determination to leave this World Cup with a medal as they made several bursting runs from the midfield but every Australia attack was met by a stoic Spanish defence. It was the strength of the defence that led to the second goal. Australia attacked but lost possession. The ball up the pitch found Beatriz Perez, who in turn found Berta Bonastre. The player, who had been so devastated after her team’s loss to Ireland the previous day, was on hand to fire home. The third quarter saw Spain look to increase their lead; again their defence were solid as the Australia midfield and attack tried to unpick them. The breakthrough eventually came as Emily Hurtz found Emily Smith. The Hockeyroo’s captain’s shot was goal bound but Kathryn Slattery just made sure and got a nick on the ball to halve the deficit. As the fourth quarter counted down, both teams began to look as if they were suffering from the heat and the previous day’s exertion. A crucial moment in the match however saw Alicia Magaz strike the ball home to extend the lead to 3-1. Australia’s Head Coach Paul Gaudoin removed Rachael Lynch and the Australia side ramped up the pressure. Slattery and Maddy Fitzpatrick both ran at the Red Sticks defence but found the wall impenetrable. The last chance for Australia came with just over two minutes left. A penalty corner was taken by Georgina Morgan but her shot was not strong enough to give Smith the chance of a deflection. 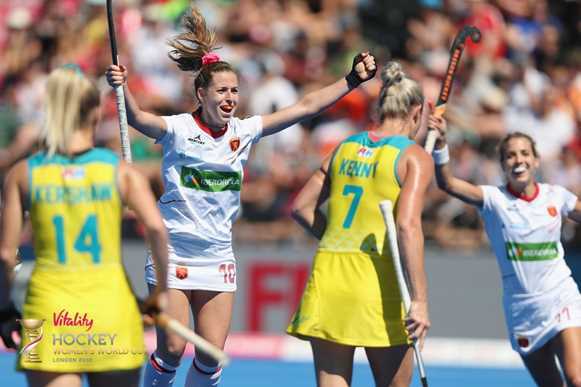 As Australia’s most recent recruit Lily Brazel thumped the ball forwards, the excellent Rocio Gutierrez swept the ball forward and Spain were able to celebrate their first medal at a World Cup. “We didn’t put in a performance yesterday, the girls were gutted and they wanted to put it right today,” said Spain’s Head Coach Adrian Lock. “We took it to Australia. the goals went in and once they went in we weren’t going to let that go. “We talked about the opportunity to do something that no-one has ever done before. We wanted to make our own history. We have played them five times this year, we hadn’t beaten them but we drew four times. We knew we could win today,” he added.